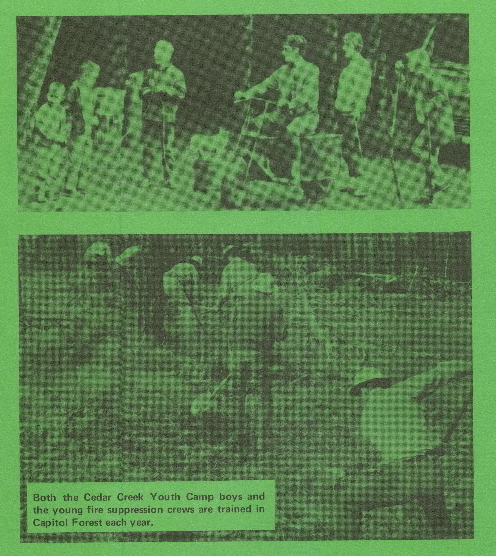 First timber claims in what would become Capitol Forest. last past the first winter. Start of logging in the forests of the Black Hills. Start of logging camp that would become the town of Bordeaux. through out the Black Hills. Many rail beds later became trails and roads that are still used today. Logging town of Bordeaux, in what is now Capitol Forest has a population of 300-500. Purchase of 52,000 acres of logged, burned-over land for 50 cents per acre. FOREVER as commercial forest. 14,000 acres are eventually transferred. Bordeaux becomes a ghost town. public is kept out of Capitol Forest to prevent devastating wildfires. needs of the resources and the trusts. forest fires and trail maintenance. Forest management continues under the newly created Department of Natural resources. First commercial thinning of forest to promote a healthier forest. 15,000 acres added to the forest. described and regulated under a forest plan. 10,000 acres added to the forest. Since 1980 forest timber has increased 1 billion board feet. DNR maps historic sites in Capitol Forest to protect remnants of its heritage. no longer visible due to the healthy and rapidly growing reprod Douglas Fir. More Historical Videos Here. C-7000 To Green Line #6 January 2004 from CapitolForest.com on Vimeo.